Visit debenhams.com/careers or debenhams-careers.com and get a full picture of how the job opportunities spread through the careers areas in Debenhams. 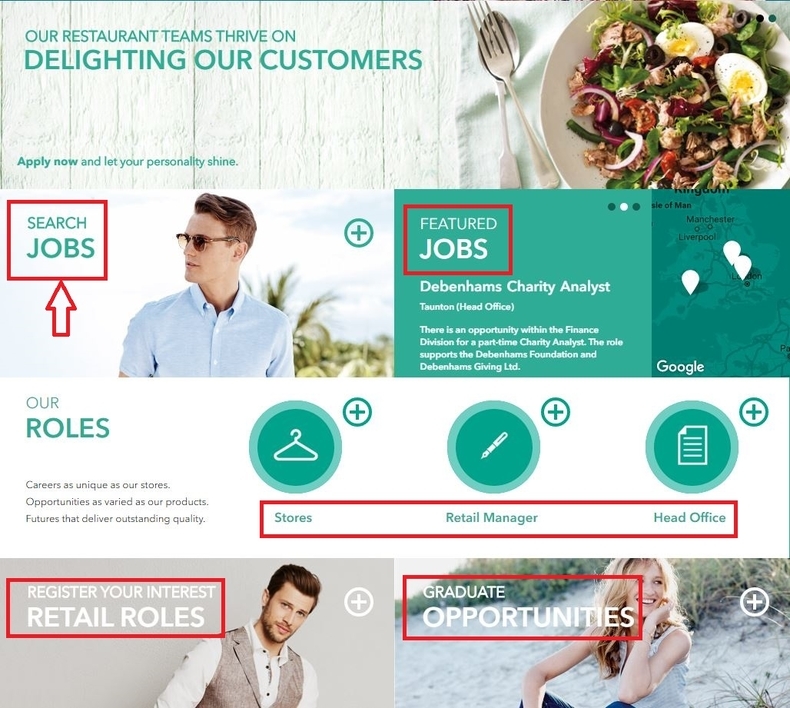 You're presented with direct job search link, featured jobs, specific careers areas. Here we just choose to search jobs as the arrow directed. After you click SEARCH JOBS in the last step, you'll be shown the page below asking you to enter your town or postcode to locate the nearby job opportunities or choose the department that you want to work for. Here we click the store roles and we'll be shown 10 job opportunities. Take Sales/Service Adviser as an example to go through the whole online application. Use basic search or advanced search to help you find the exact job title you'd like to apply for or browse search results to find one that suites you best. Here we just pick one from the search results and click the title to move on. Read job description of the position you are applying for and click Apply Online if you're ok with all the requirements listed in the job description. Enter your user name and password to login. 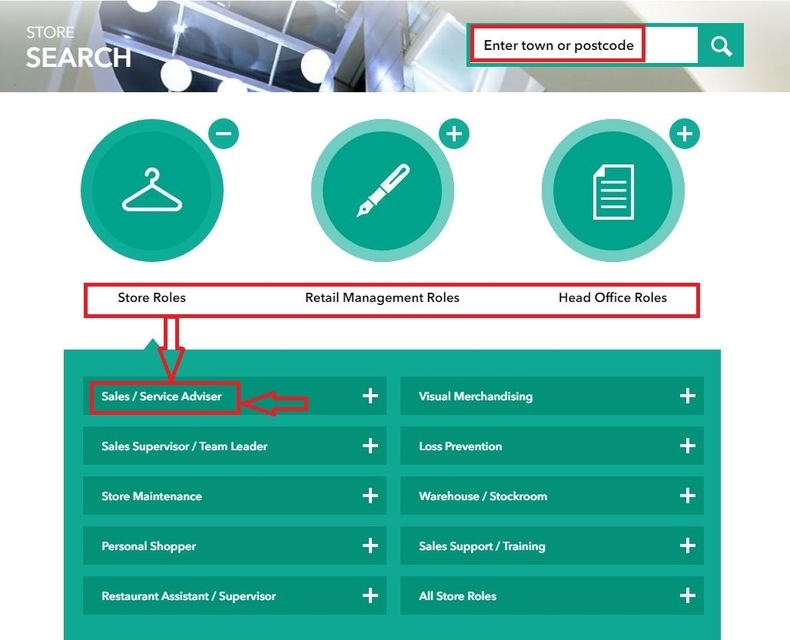 If you have not used Debenhams careers site before and have not received an email notification of registration, just click "New User" and follow the instructions to create your account. 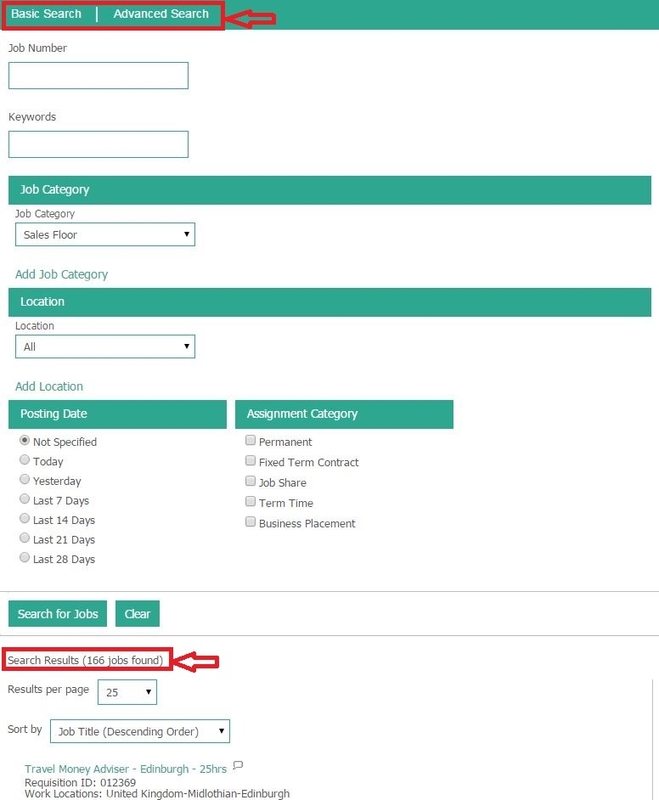 Once your account is set up, you can quickly and easily Register for Job Alerts, Apply and keep track of your applications! Afterwards, Accept the Privacy and answer some pre-employment questions to proceed. 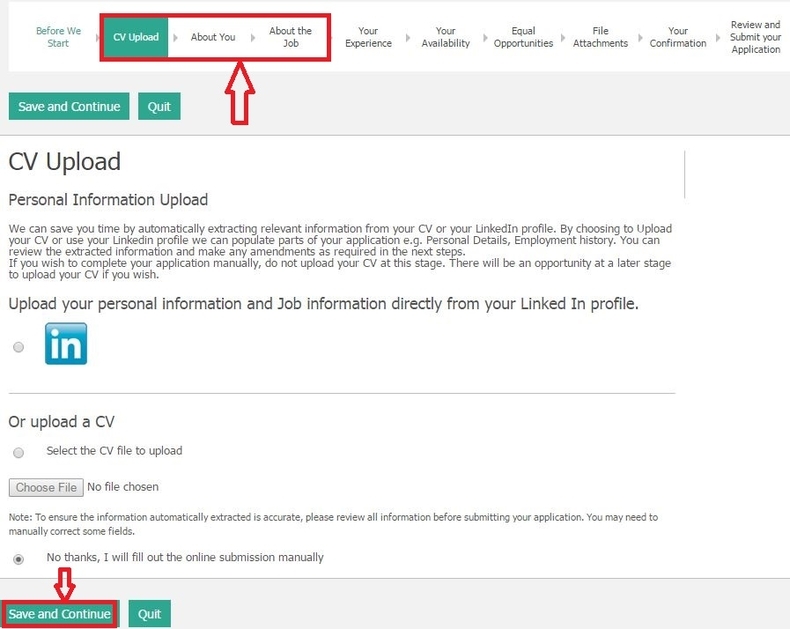 Upload your personal information and Job information directly from your Linked In profile or upload a CV by selecting file from your computer, and then fill out your personal info form and answer some questions about the job. 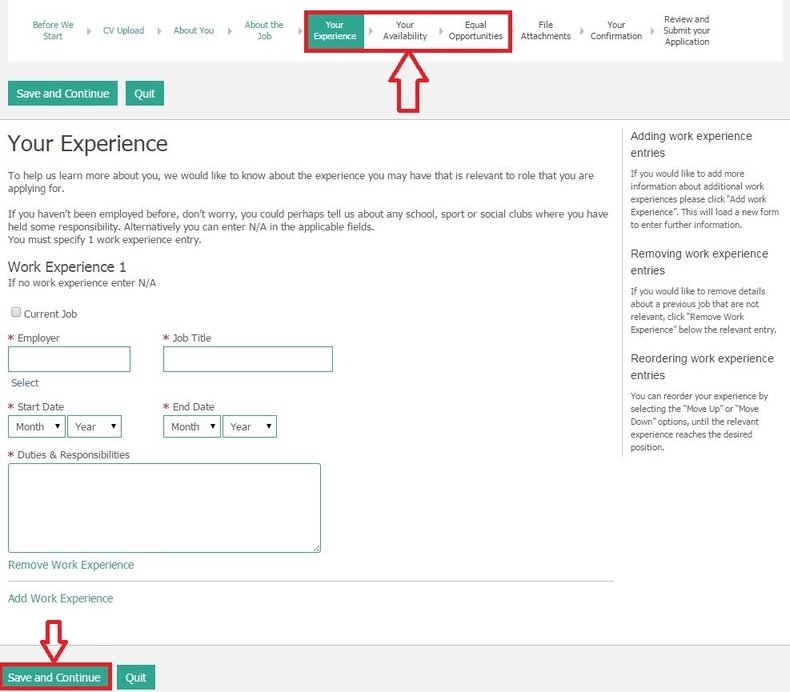 Step 7 requires to list your previous job experience starting with the most recent one, after which you can indicate your availability by choosing the date on the chart and then finish the equal opportunities part by selecting your gender and identifying your ethnic and disability status. All information will be treated in the strictest confidence and is not visible to anyone involved in the recruitment process. 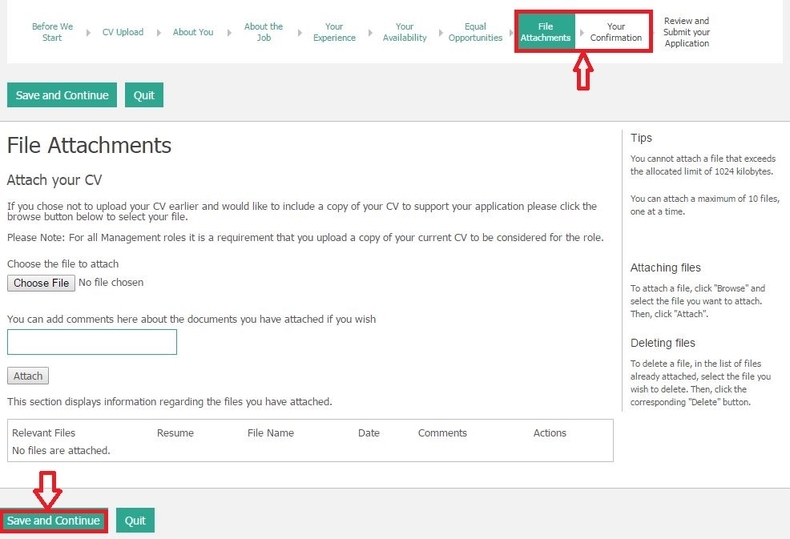 If you choose not to upload your CV earlier and would like to include a copy of your CV to support your application please click the browse button on the page to select your file. Please Note: For all Management roles it is a requirement that you upload a copy of your current CV to be considered for the role. Afterwards, indicate how you hear about the job by selecting your source type, read the statement and e-sign your full name and address to confirm your application. Review the summary of the information you have provided and then submit. If you wish to make any amendments before you confirm this submission select 'Edit' next to the relevant section. Please note once this vacancy has expired you will no longer be able to make any changes. If you confirm all the info are correctly filled in, just click Submit to submit your application. After 9 steps of efforts, you finally get your online application process completed. The recruitment team will review your submission in line with the criteria of the role. 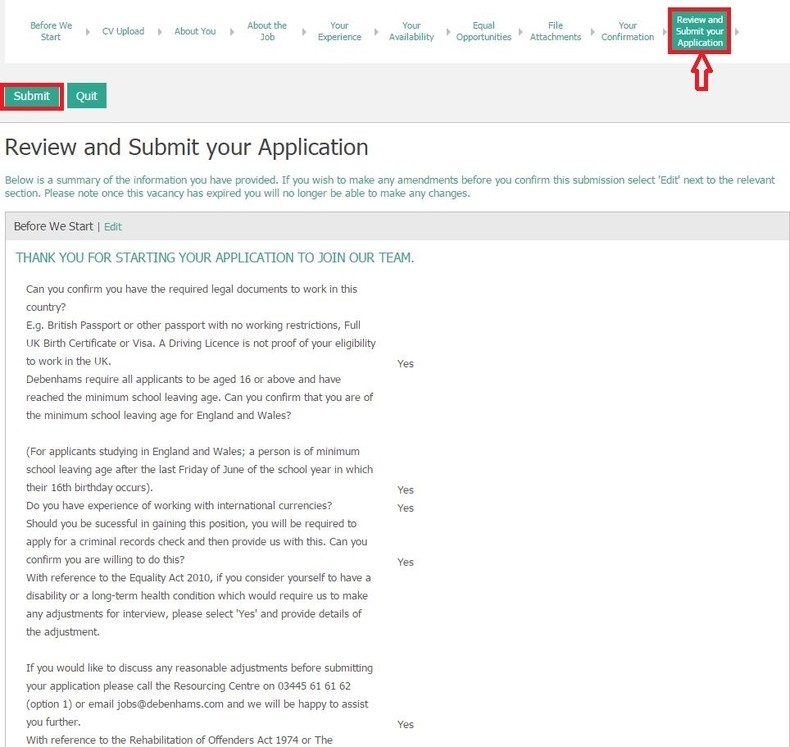 You will receive the outcome of your application within 7 days via the email address you have provided. 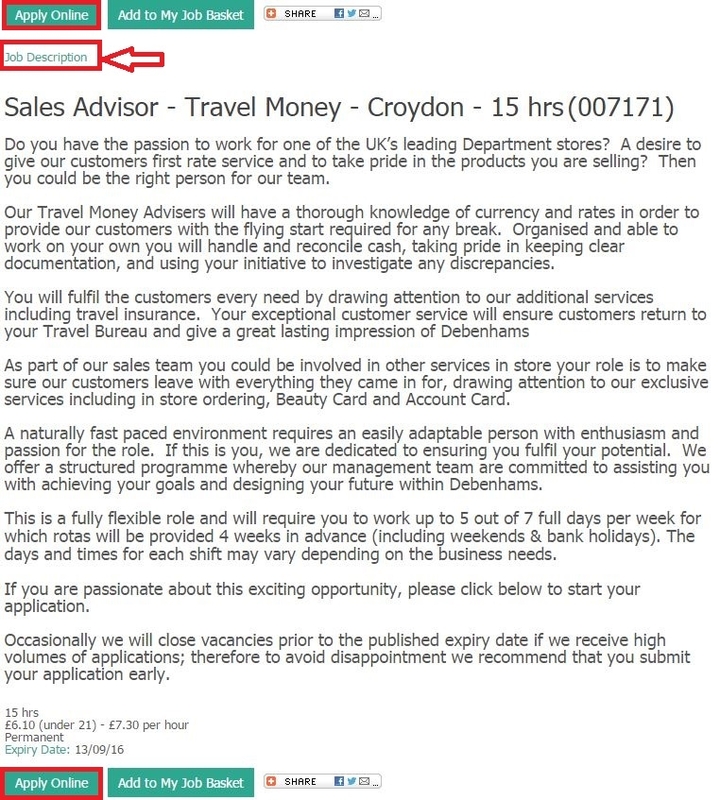 Click debenhams.com/careers to apply for Debenhams jobs online.